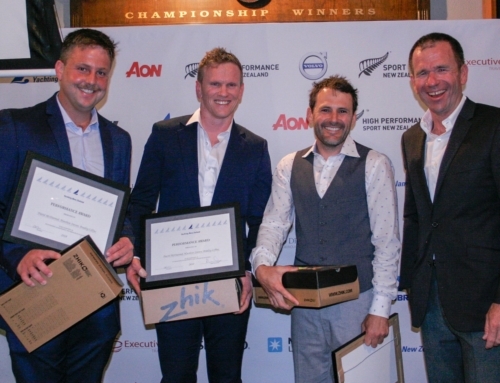 It would seem that local knowledge is no match for the Australians at the 2016 Maersk Line 18′ Skiff ANZAC Championship. The fleet of 14 boats are racing on the waters of the Waitemata Harbour off Orakei, where the local fleet, the Auckland Skiff League, race on a weekly basis. Yamaha, who have extended their lead over the fleet, have been sailing on this stretch of water for the best part of 30 years combined. David McDiarmid, Matt Stevens and Brad Collins are showing true form, yet are keen to keep everything on the low down until the final race comes to an end. “We can’t speak too early. There is still a bit to go in this one. We are only half way, and it will be a regatta of two halves. Knight Frank, kicked off the day really well taking the gun in race three. 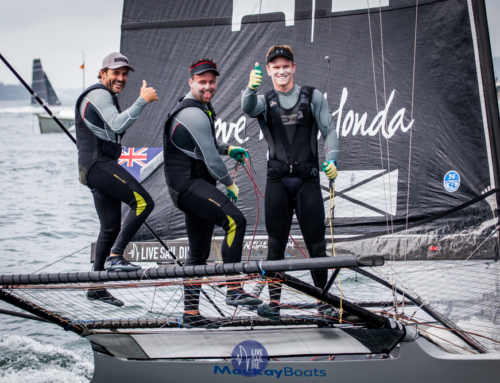 Riley Dean, John Little and Matt Coutts started the regatta a little slower than they wanted to but were happy to come away with the win. “We followed Yamaha’s advice from day one, and we went left. It worked!” said Dean. Thurlow Fisher Lawyers are holding onto second overall after starting day two with a fifth, third and finishing off with a gun. Peroni has held onto third place. 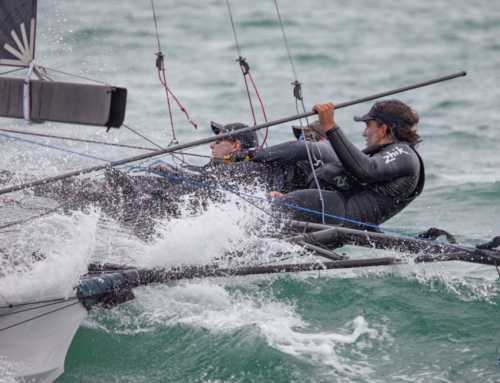 Murray England, Sam Marshall and Luca Browne on ASCC were having a good time out on the race track but were forced to head back to shore early after a massive blow out. “Breaking our kite makes us sad…” whimpered skipper England. At the back of the fleet is relative new comers to the 18 footers, ASC. But Aaron Robertson, Thomas Oldsie and Will Cobb don’t consider themselves there just to make up numbers. They have a clear goal, to finish better than 14th place overall. “We are going for the ‘People’s Choice Award’,” said a cheeky Oldsie before their regatta got underway on Friday. “We haven’t really sailed in a fleet yet! But we do want to finish every race with all three of us on board. We are keen to be in the mix,” said skipper Robertson. “10th overall would be great! We would be stocked to finish 10th, but having only sailed together twice, we don’t hold high hopes. Wait! Another goal is to not have any injuries!” laughed Robertson. After five races, ASC are 12th overall. Howard Hamlin and his crew on Harken, Cameron McDonald and Daniel Phillips are now leading the handicap point score. “We that’s a bit embarrassing isn’t it!! !” laughed Hamlin when told of the news. Fives races have now been completed. Two harbour courses on Day One, two windward/leeward races and a long harbour course on Day Two has brought the regatta to the half way mark. The race drop now comes into play. Racing continues tomorrow with another three races set to be completed in the Auckland rain, with the forecast turning wintery for the first time this season.